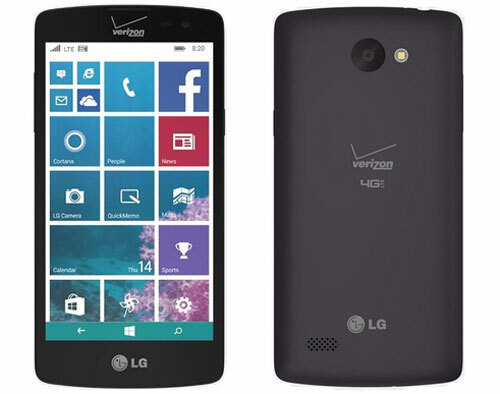 Three years after swearing off Windows Phone, LG is back with a budget handset for Verizon Wireless. The LG Lancet has a 4.5-inch display with 854-by-480 resolution, a Qualcomm Snapdragon 410 processor, 8 GB of storage (with MicroSD expansion), an 8-megapixel rear camera, a VGA front camera, and a 2,100 mAh battery. Those specs put the Lancet squarely on the low end of the smartphone spectrum, but it has a price to match. Verizon is charging just $120 for the phone without a contract, or you can get it with a two-year commitment for $20. For software, the Lancet runs Windows Phone 8.1, but LG is also borrowing some features from its Android phones. For instance, users can wake or lock the phone by double-tapping on the display, and can snap a selfie with a hand gesture. A Quick Memo application lets users take notes or capture the screen during phone calls. The Lancet is available now through Verizon’s website. If you’re looking for a new high-end Windows Phone, it’s not going to happen until Windows 10 arrives this summer. The story behind the story: LG was one of the first Windows Phone manufacturers in 2010, but a few years ago the company publicly declared that it would stop supporting Microsoft’s platform, citing a lack of meaningful market share. 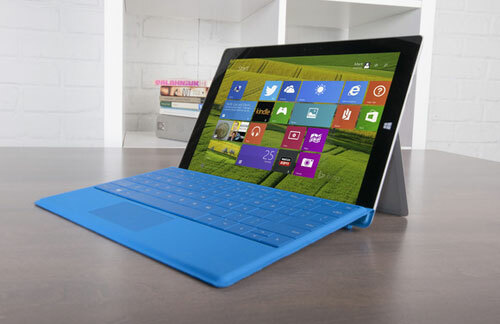 While Windows Phone is still far behind iOS and Android, Microsoft’s hardware reference design and support for on-screen buttons now makes it easier for phone makers to turn their existing Android handsets into Windows Phone variants. That seems to be the case here, as the Lancet is very similar to one of LG’s recent low-end Android phones, the Leon. 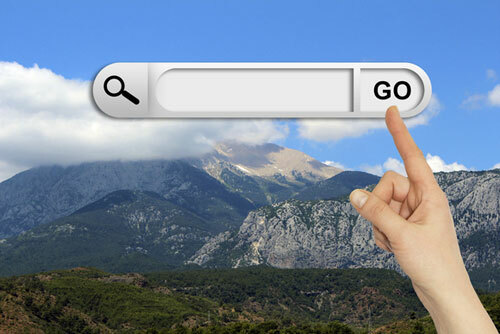 Your website could be doing a lot more harm to the planet than you think. It might seem like a flash on a screen couldn’t cause much damage, but every small feature of your site has a discernible impact on the environment, with more complex features requiring greater resources to maintain. Over time and in great quantities, it adds up. Many factors – from the color palette you choose to where you host your site – can influence your site’s carbon footprint. Designing more environmentally friendly site for your business lets your customers know you have an ethical stance that reaches beyond the balance sheet. Plus, going green can also make your website more efficient, allowing users to access your content more quickly. Web hosting providers devour a vast amount of energy to power servers and related equipment 24 hours a day year-round. A study by McKinsey & Co. even projects that by 2020, data centers will produce more pollution than the airline industry. One of the most effective ways to curtail this is to use a web hosting provider with green dedicated servers. These companies power their servers using a renewable power source like geothermal energy. According to one recent study, 40 percent of consumers will abandon a website if it takes more than three seconds to load. But slow sites don’t just test customers’ patience; they also eat up more energy. Taking steps like minimizing HTTP requests, optimizing images, enabling browser caching, and “minifying” your code can help cut down on page load times and the associated energy drain. Google, WordPress, and other services offer tools that can help you assess and optimize your website’s efficiency. Different colors use different amounts of energy on different types of monitors. In the age of CRT monitors, black was trumpeted as the most energy-efficient hue, but today’s popular LCD monitors use more power to display dark colors. Incorporating more white in your website design will save small amounts of energy with each page load that will add up over the long haul. Reducing the environmental impact of your site doesn’t require a teardown of your infrastructure or business goals. Just these few considerations can have a dramatic impact on both the environment and your bottom line. When you get a new message from someone it will include context information such as how you’re connected to them or where they’re from. Facebook says it will also include a larger photo. The new context can help jog your memory if an old high school friend is coming into town or an acquaintance from your community wants to say hello. Facebook’s messaging update is rolling out to both Android and iOS users in the U.S. It’s not clear if the new feature will also show up in Facebook’s messaging window on desktop PCs. This is the second context-based feature Facebook has rolled out recently. In April, the company introduced Hello for Android that provides caller ID information based on public Facebook data. Why this matters: While it’s handy to see reminders about people on your friends list, Facebook may be more interested in showing you context about people you don’t know. With more than one billion active users every month, Facebook is certainly in a good position to help connect you to strangers. To make context truly useful in messaging, however, Facebook would have to loosen the restrictions on how unconnected people can contact you without getting shunted to the ”Other” inbox. 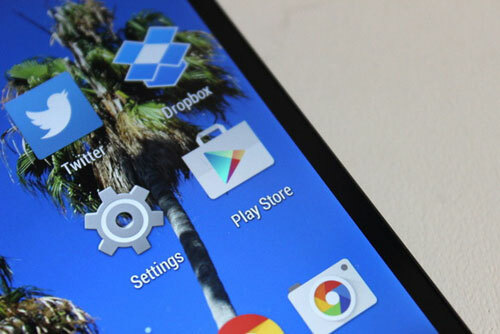 Google is giving Android developers a firm deadline for submitting apps and games they want to the new Designes for Families section of the Play Store. The cutoff is May 28, just one day before the beginning of Google I/O. The developer conference is where Google makes announcements about new initiatives, so we’re expecting the new family-friendly app selection will get prominent play. The email (pictured) reminds developers their apps must meet specific content ratings and other requirements in order to be included. 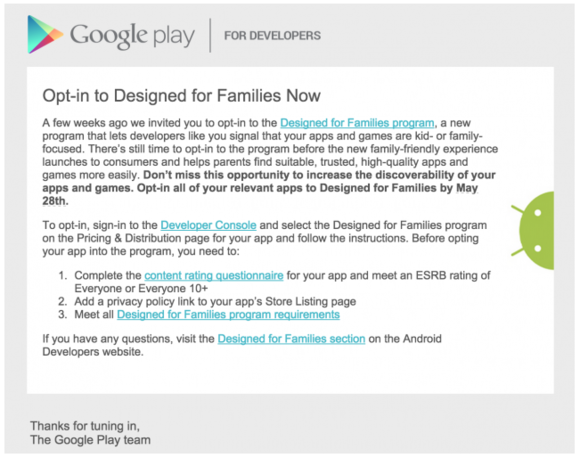 An email to Android developers details how to get apps ready for the Designed for Families selection. The story behind the story: Google’s Designed for Families program is an effort to showcase the kid-friendly apps and games in its Play Store. Making them easier to find could mean more downloads and in-app purchases, which is good for Google and the developers alike. The new effort may also help Google catch up to Apple’s App Store, which is regarded as having the best collection of educational and kid-friendly apps.